OceanicDreams: (Ir)relevant comments on a photograph. To start with: Congrats, Allen! (Ir)relevant comments on a photograph. To start with: Congrats, Allen! Allen Walker of Scottburgh took this spectacular photograph at Aliwal Shoal. It's not a "pretty" picture - but it is highly dramatic, uncomfortably dark, and mysteriously moody. The shot is, to me, a photojournalistic image at its very best. Allen squeezed the shutter at the decisive moment. He did so either mechanically or intuitively. He certainly didn't compose the photo; the photo composed itself. I know that sounds quite awkward - but how would you describe it? Difficult. If an image says more than a thousand words, how could one comment on it aptly with less than a thousand words? 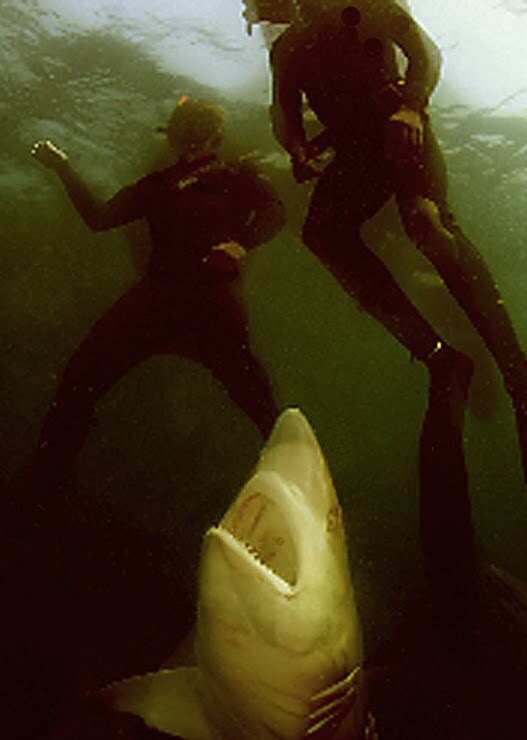 Both divers, incidentally tough members of the Australian national rugby team, have never snorkelled with sharks (I guess I can tell by their body "language"), of which the one who was closer to the photographer has been unintentionally cropped, make for a fantastic background. Whatever, blah, blah. blah.... To sum it up, Allen's shot is one of the best underwater photographs I have ever seen. This is meant to be a straight compliment, and under "normal" circumstances I should not feel the necessity to explain it. However, in the shark world circumstances are not always "normal", so I need to elaborate a bit. Some people don't understand me, and attack me for being: ego-driven, petty-minded, destructive, unreasonable, incapable of seeing the 'larger' issues such as effective shark conservation, hurting the 'cause' - or they accuse me of "bad-mouthing" others, especially those who are the "real" shark lovers out there, the "sharkiest people in the world" (some adjective, huh? ), those who selflessly "dedicate their lives" to sharks (often making a very comfy living in the process, as I should add...). This is who I am: When I don't like things, I say so - if necessary politically very incorrect - and "make" enemies; by the same token I can praise, and do so with much pleasure, when I like things others do or say. Thus, I would think that Allen will be quite surprised to read what I am saying about his master photograph. At the end of the day, a basic common understanding prevailed - Allen can be a young raging bull with a soft heart, and I can be a pretty aggressive old bull with a soft heart. Our 'heart condition' is our bond, as it were. Whatever, blah, blah, blah... Enjoy the pic as much as I do.